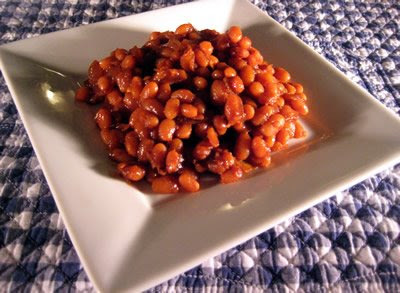 Much like chowdah, baked beans are one of those recipes that can somehow be perfect both in the dead of winter and in the dog days of summer to boot. In the winter, I prefer my baked beans with some bacon for flavor, but in the summer I like them more barbecue-y. And in any season, I love them heavy on the molasses! This iteration is zesty but not heavy or goopy (as barbecue-type beans can sometimes get.) This recipe requires having the oven on for some time. If the fates align, the ideal time to prepare this is on a rainy afternoon a day or two before heading to a barbecue on a gorgeous sunshine-y summertime day. Soak beans overnight in cool water, covered by about an inch of water. 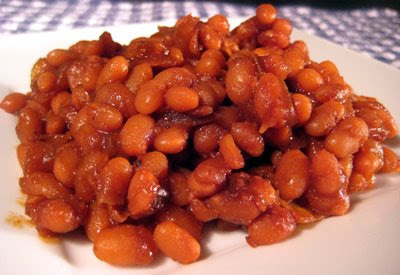 * Drain soaked beans, discard soaking liquid, and rinse thoroughly in cold water. Place beans in a large ovenproof pot, and cover with plenty of cold water. Bring to a boil, then lower to a simmer. 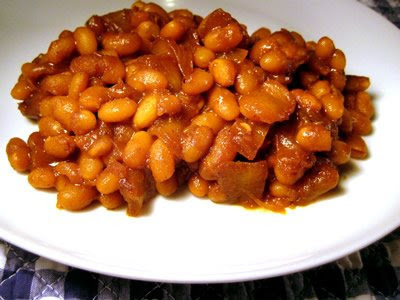 Cook, partially covered, for about 1 ¼ to 1 ½ hours, or until beans are tender. Check the water level during cooking, adding more if the water nears the surface of the beans. Once beans are tender, drain and reserve cooking liquid. ** If, in an effort to be helpful, your spouse/partner/roommate/passing stranger tosses out your cooking liquid in a misguided effort to clean up and help out, you can use water instead. Hypothetically speaking, of course. I love that these are vegetarian baked beans! Sounds like a great mix of spices too. I love baked beans! perfect winter comfort food or summer bbq side! I love veg baked beans -- I make mine in a crock pot, which means I can go out and leave them unattended. On the other hand, your recipe takes much less time from start to finish. I made these beans today. I was a little dubious that the sauce was too strong, especially since I didn't have cider vinegar and used 1/4 c. balsamic vinegar instead, and I used two onions. But in the end they turned out great, very tangy. Thanks. These are so good! I make them quite often, especially in the summer for BBQs.